This morning at the Moscone Center in San Francisco, Microsoft kicked off its semi-annual BUILD developer conference with a keynote address detailing what’s coming now and in the near term for its major consumer platforms of Windows, Windows Phone, and Xbox. Microsoft had a lot to discuss, and started the keynote off with Joe Belfiore officially announcing Windows Phone 8.1. 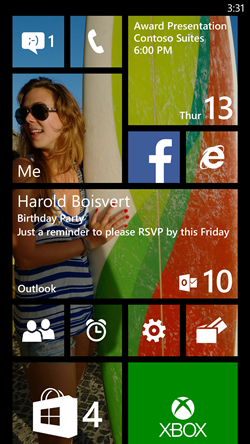 Unlike previous updates to Windows Phone 8, this is certainly a major release. Microsoft is really trying to push Windows Phone into a more global audience. At Mobile World Congress, they had announced that they are now partnering with Nokia (which they are awaiting regulatory approval of the purchase), Samsung, HTC, Huawei, Lenovo, LG, Xolo, ZTE, and Gionee to manufacture Windows Phones. At build today, Micromax and Prestigio were also announced as additional hardware partners. Micromax is based out of India, and Prestigio is headquartered in Cyprus. Both Prestigio and Micromax phones were briefly demonstrated, and were both based off of the Qualcomm reference design for Windows Phone. Just looking at the companies that they’ve partnered with, it’s fairly apparent that they are trying to push Windows Phone into different markets that are well served by local consumer electronics companies. Next, the long awaited (and I mean long awaited) Action Center was shown. It is fairly customizable in how it will allow notifications for applications, and it means you won’t have to pin every single app to your start screen in order to get usable notifications from it. It also allows you to choose what kind of a notification each app can perform, including audible, toast, or just a notification in the action center. Also the action center allows quick access to things like WiFi but can be configured however the user likes. It’s certainly nothing game changing, but for Windows Phone users it will likely be very well received. Next up was new Lock Screen features, and a set of APIs to allow developers to integrate more deeply with the lock screen. 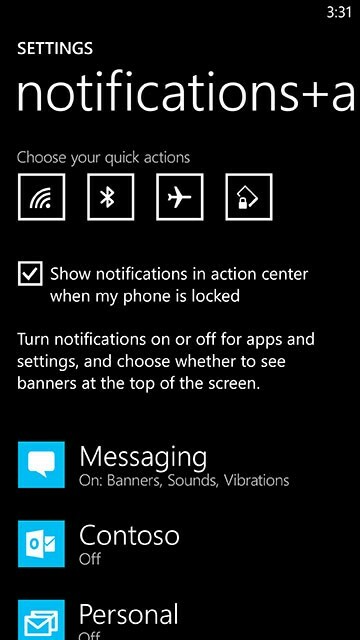 Windows Phone 8 already allowed apps to control the lock screen, and this is a further development of that. The demonstrations were certainly interesting, but we’ll have to wait and see what developers can come up with. 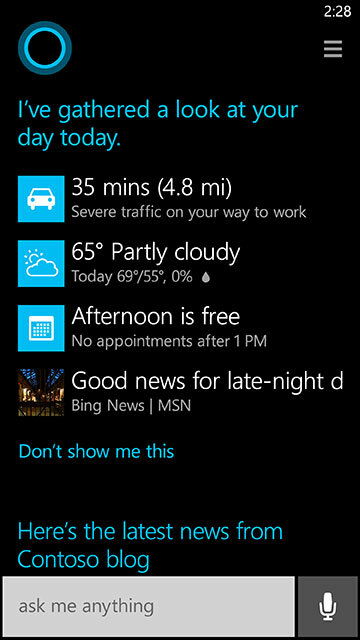 Another new feature is the ability to show more tiles on the start screen. 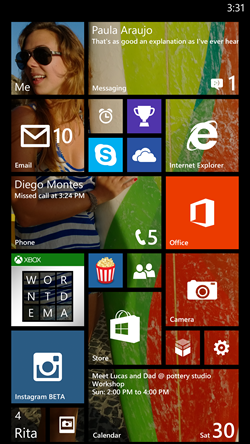 With Windows Phone 8 GDR3, an extra row of tiles were added for any 1080p phones, allowing three medium size tiles on one row. This option is now being extended to all phones, so it will be up to an individual to decide whether or not they want to cram extra info onto the Start Screen. This adds a feature that already exists on Windows 8. Also on the start screen, users now have the ability to add backgrounds to their start screen. This gives a cool effect where any tile that is colored by the phone theme turns transparent, and allows the background to be seen with an almost old school side scrolling video game effect. The background scrolls, but at a slower speed than the tiles are scrolled, giving a sense of depth. I don’t want to compare it to the iOS parallax feature, because it’s really quite a different effect, although both have the same purpose which is to give the illusion of depth on the screen. If you don’t like it, you can always turn it off, but certainly Windows Phone has needed more customization options for users to make their phone their own. Cortana was launched next as a digital personal assistant. 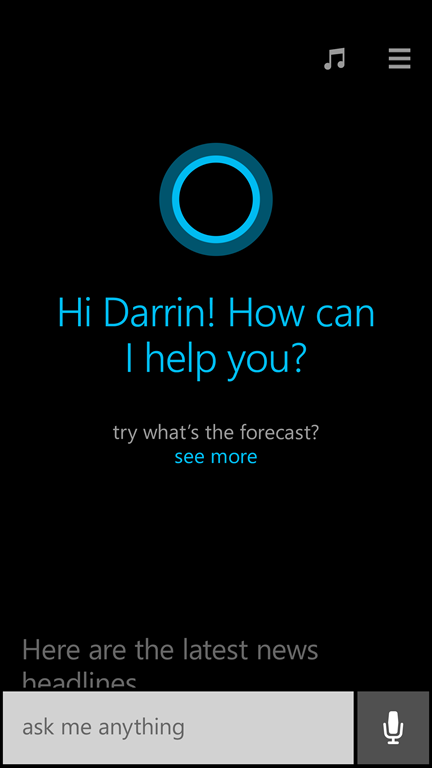 Powered by Bing, Cortana is a complete replacement for the search button on Windows Phone. You can still type your questions in if you don’t love talking to your phone. It also allows apps to integrate for speech enabled apps on the phone. In addition to being a search function, it also has a live tile function to scroll through news and updates from friends and family. Cortana looks like a combination of Siri and Google Now and looks like it has some good natural language abilities and contextual search so you can refine searches after they’ve been done. It will be fun to see how it works in the real world. In the demo there were a couple of misheard words which fooled it, but it was far from an ideal location. Enterprise support was also beefed up. There’s certainly a market here as many enterprises already are heavily invested in the Microsoft Server, SharePoint and Office tools, so it’s always been a bit odd that the enterprise support has been lacking ever since Windows Phone 7 launched with only a subset of the enterprise features of Windows Mobile. With Windows Phone 8.1 VPN support was finally added, however it wasn’t clear just what kind of support is available. If it’s a direct port of the Windows RT VPN, it will be a good solution for a lot of companies, but Cisco’s popular AnyConnect software is not available on RT due to API limitations. Cisco is interestingly absent from all of the slides and materials, so it’s a good bet that AnyConnect is not supported yet. Mobile Device Management was also demonstrated, and the MDM client supports many management suites. With Windows Phone 8, Microsoft introduced Data Sense to show a person how much of their data plan is available at any time. It shows which apps are heavy users, and can stop your data connection before incurring overage charges. Originally it was carrier restricted, but later on became available for all phones (unless explicitly blocked by a carrier). Battery Saver was also added to increase the run time for a phone but disabling apps if the battery was low. GDR3 then added Storage Sense so that you can keep track of what is on your phone as far as apps, music, videos, or the dreaded “other” category. 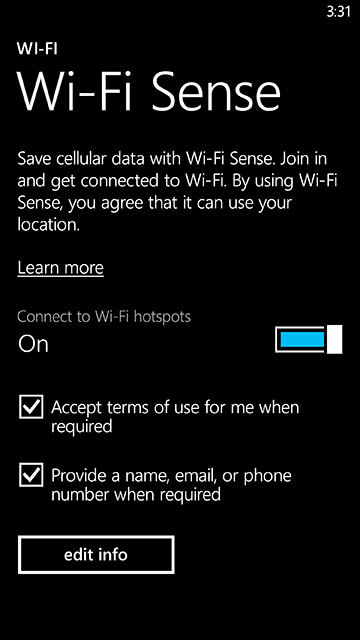 Windows Phone 8.1 now adds Wi-Fi Sense which allows seamless Wi-Fi connections to trusted networks. Windows Phone 8.1 also adds Settings Sync like Windows 8.1, as well as the ability to broadcast to an external display using Miracast or USB. Internet Explorer 11 is of course the new browser, and apps like Calendar have been heavily updated. The Music and Videos Hub is no more – instead replaced with standalone applications for each task, which should in theory allow much faster updates of the actual programs. At the same time, the People Hub was been expanded to allow developers to hook right into it. Likely the biggest announcement at build was the new Universal Apps. 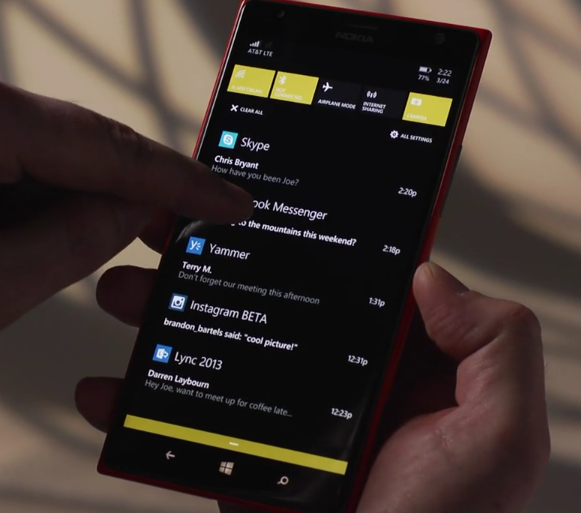 Developers can now target a single application at Windows Phone, Windows RT, and Windows 8. Inside the package will still be multiple binaries, but they will share an Application ID allowing a single purchase to now allow installs on all the classes of devices. With Microsoft hoping that their tablets can compete against iOS and Android, the store needs this unification. I say it’s the biggest announcement, because no matter what they do with the Operating System, if there’s not a strong ecosystem of applications behind Windows Phone 8.1, it’s going to continue to struggle in the market. And of course, the enthusiast program that was created for the last update is going to be available. As soon as the final code is ready for download, anyone with a (free) developer account will be able to get the software, bypassing the carrier update process. Hopefully they will do the same with firmware updates, but it’s a big change from how updates have been handled in the past. To sum up the event, Microsoft looks like they are finally pushing forward with Windows Phone. Windows Phone 7 launched as a way to introduce a touch based phone OS and ditch Windows Mobile’s stylus based interface, but it was crippled by both Windows CE and an extremely limited API based on Silverlight. Windows Phone 8 moved the entire platform to the same kernel as Windows, and the same was true for Xbox after the launch of the Xbox One. It was a big accomplishment but didn’t really push forward too many new features since the coding time was clearly spent on the port. With 8.1 though, the entire update is focused on adding new features to the platform. They are certainly late to the party, but the features look excellent. Now to wait for the final software release (indicated to be later this month) and a chance to run the update to see what kind of improvement in user experience will be seen. 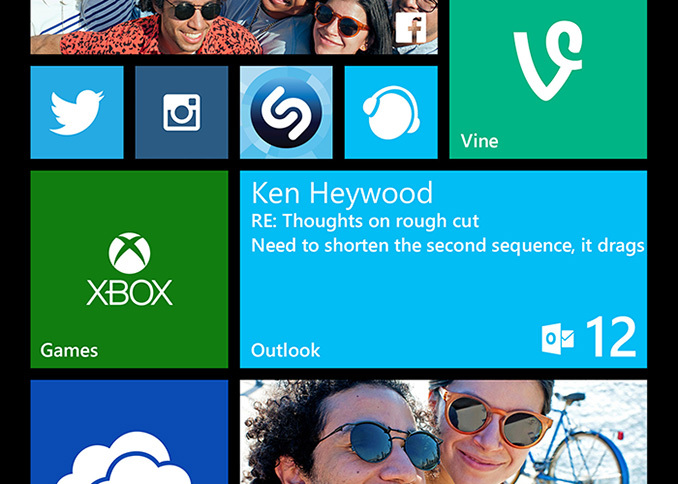 I think universal apps is the killer app that the Windows ecosystem needs.